Facing a public relations nightmare in 1922 over recent scandals, the film community produced Hollywood Snapshots, a promotional film portraying screen folk as wholesome to middle America. Presented online by the National Film Preservation Foundation, Snapshots captures remarkable images of burgeoning early Hollywood, including Hollywood Boulevard, the Famous Players – Lasky Studio, and the Pickford – Fairbanks Studio. 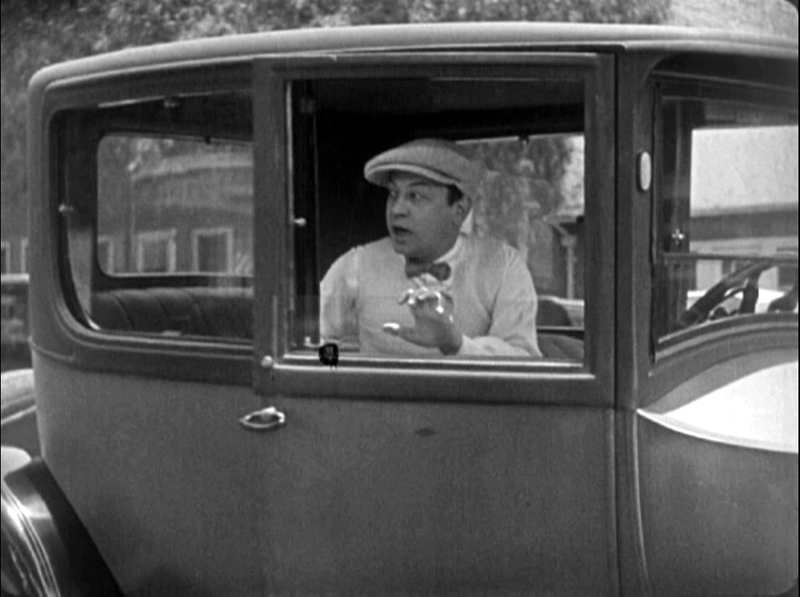 During Snapshots a rube named Hezekiah travels to Hollywood to witness the decadence first hand. Here, looking east, he boards a trolley, with the former Methodist Episcopal church at the SE corner of Hollywood and Vine appearing at back. The church was soon demolished to make way for the Taft Building which opened in 1923. USC Digital Library. Hezekiah departs the trolley near the north end of Cosmo Street, with the Palmer Building, still under construction, behind him to the left, and the Markham Building to the right. The aerial view shows Cosmo looking west towards the corner of Cahuenga. Huntington Digital Library. The trolley now travels east towards Cahuenga. The Security Bank Building to the left, which opened in 1922 as the tallest building in town, sparked the Hollywood construction boom during the 1920s. The tallest building on the right is the Markham Building. This 1922 SE view along Hollywood Blvd. 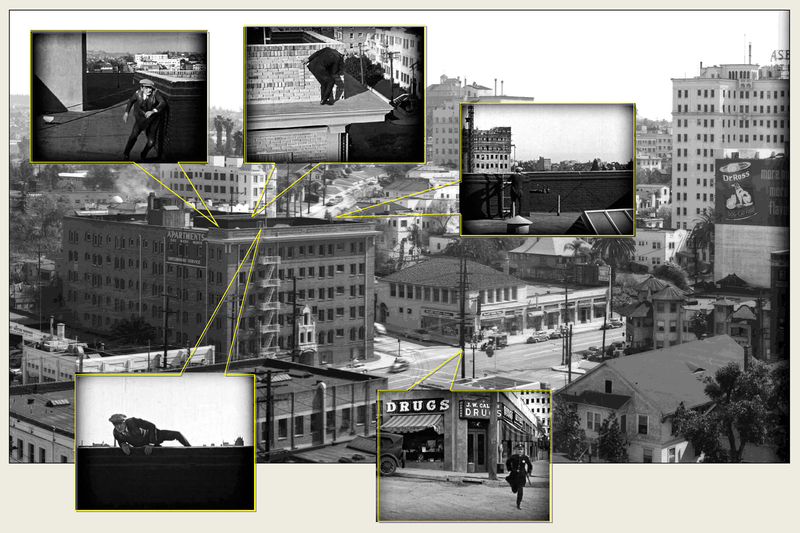 shows the church at Vine (oval), Cosmo (box), and the direction of the trolley heading towards Cahuenga. Marc Wanamaker – Bison Archives. Looking east down Hollywood Blvd. from Highland, before the landmark First National Bank building was constructed in 1927 on the NE corner to the left. The four story C.E. Toberman Building appears on the SE corner to the right. This corner building is now two stories tall. LAPL. Further west, and still looking east, we see the H. P. Rehbein Richfield gas station on the SE corner of Sycamore, as it appears in the movie in 1922, left, and again as it appears in Harold Lloyd’s Girl Shy (1924) to the right. The former Garden Court Apartments, 7201 Hollywood Blvd., stood across from Sycamore, appearing in the film, left, and in this Watson Family Photo Archive shot. Hezekiah asks a local where to search for all of the scandals, in front of the former Hollywood Hotel, at the NW corner of Hollywood and Highland. USC Digital Library. The film cuts to a shot of LA’s finest marching from the former joint fire/police station at 1629 N. Cahuenga. Tommy Dangcil. Hezekiah then strolls north past the Vine Street entrance to the Famous Players – Lasky Studio (oval) above. The famous Lasky barn, future home to the Hollywood Heritage Museum, stands on the corner of Selma to the left. HollywoodPhotographs.com. A closer view of the Vine Street entrance, paired with a 1920 photo. HollywoodPhotographs.com. Here, Lois Weber exits the building, providing a slightly wider view, matching this 1922 photo. Many other stars appear in Snapshots leaving this doorway. HollywoodPhotographs.com. During a brief scene, Carter De Haven (right) orders coke, no, not that kind, but you know, the drink in a bottle, from this vendor set up on Vine Street directly facing the studio. At back, the former home at 1518 Morningside Court (wait, there’s a Hollywood street called Morningside Court?!?) 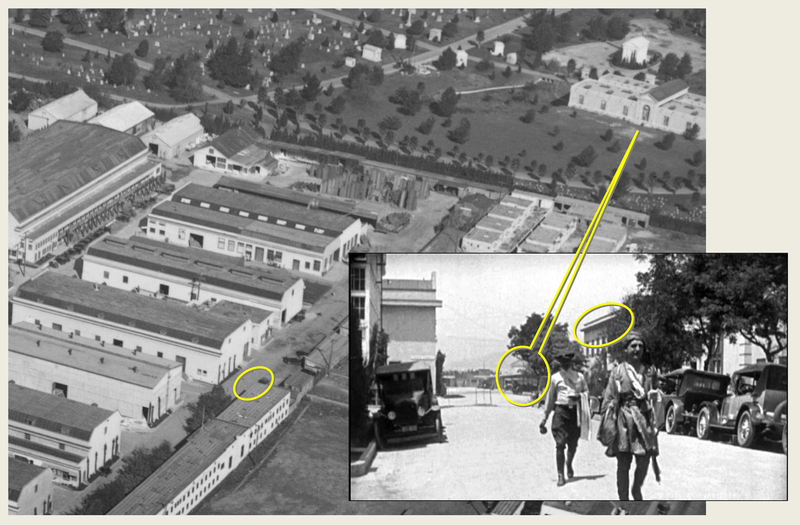 appears as well in this 1919 aerial view looking west across the Famous Players – Lasky Studio. HollywoodPhotographs.com. 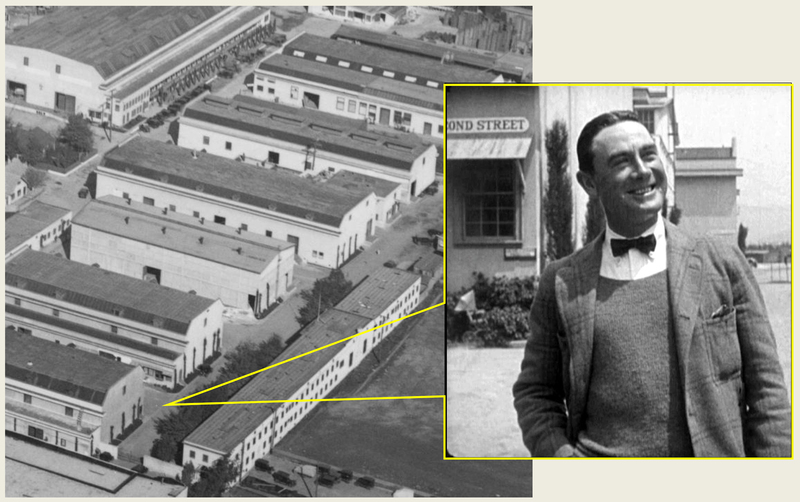 Mary Pickford’s first husband Owen Moore appears on Second Street on the Brunton Studio lot looking north. She divorced Owen in 1920 to marry Douglas Fairbanks. HollywoodPhotographs.com. Below, a matching view, looking east, showing Moore’s spot (oval) and the direction of the camera. HollywoodPhotographs.com. Another shot in the film shows the corner of the dressing rooms (oval) and the back of the mausoleum at the Hollywood Forever Cemetery. 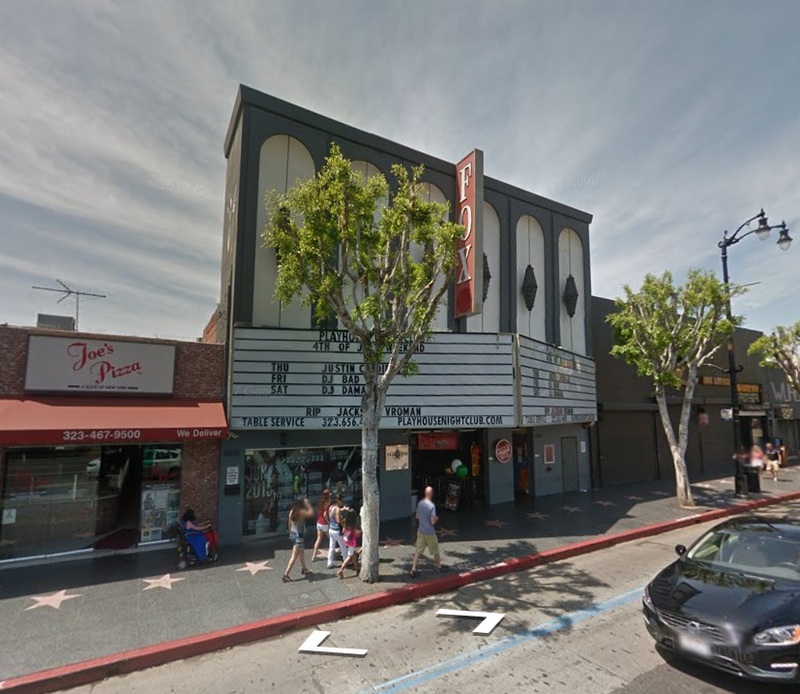 With a sudden edit, Hezekiah now walks east along Santa Monica Blvd. towards the entrance gate of the Pickford-Fairbanks Studio. The giant castle set built for Robin Hood, filmed during 1922, appears at back. A wider view of the entrance. HollywoodPhotographs.com. Soon, Hezekiah strolls past Viola Dana, right corner of photo, eating food just like real people do, pictured at the Armstrong – Carleton Cafe. California State Library. The film then portrays good clean Hollywood folks relaxing at home. Sid Smith plays on a front lawn with a boy identified as “Master Zukor.” The home has a three digit address that appears to end with a “3.” The many porch details, now painted white, exactly match this photo of 503 S. St. Andrews (center house), now all lost to apartment blocks. UCLA Digital Library. The Sanborn maps confirm the 503 address had an octagonal corner, as depicted here. Strangely, the home was not owned by Smith, but by Charles F. Zaruba, proprietor of the Washington Photoplay Theater. Perhaps this “Zukor” lad is Zaruba’s son Lionel. I wasn’t before aware of Sid Smith – the Internet says the film comedian died from drinking poisoned hooch in 1928. Historic Los Angeles residence expert Duncan Maginnis, together with “Flying Wedge” at the “Noirish LA” photo history site, identified this location – you can read a full post HERE. Above, devoted son Jack Kerrigan has tea with Mom while playing with his dog. Kerrigan never married, and reportedly lived with his mother and his domestic partner James Carroll Vincent. This view of his porch reveals the home’s 2307 N. Cahuenga address. Several homes along Cahuenga remain standing. The box marks Jack Kerrigan’s L-shaped house, hidden by the trees, now an apartment block. Huntington Digital Library. You can see Kerrigan’s L-shaped house (oval) in this SE view of the Hollywood Bowl. Huntington Digital Library. Above, Lloyd Hughes in front of the Iris Theater (see name on the floor behind him) at 6508 Hollywood Blvd. In 1922 Hughes starred with Mary Pickford in Tess of the Storm Country. As Paramount archivist Charles Stepczyk writes, the advert behind Lloyd is for Frank Mayo’s “Tracked to Earth.” At left, 6508 Hollywood Blvd. as it appears today. HollywoodPhotographs.com. Below, Hezekiah strolls north past the Hollywood Legion Stadium at 1628 N. El Centro. USC Digital Library. Looking north at the Famous Players – Lasky Studio. The oval marks the famous “barn” on Selma and Vine, now relocated across from the Hollywood Bowl, and home to the Hollywood Heritage Museum. The box at right marks the former stadium at 1628 N. El Centro Ave. Marc Wanamaker – Bison Archives. The film also shows a typical Sunday morning in Hollywood, with the Fifth Church of Christ Scientist, once located at 7107 Hollywood Blvd. on the NW corner of La Brea, packed with devoted parishioners. LAPL. Finally, Snapshots includes many cameos appearances. Top row, left to right, 1922 WAMPAS Baby Star Kathryn McGuire (her name is misspelled in the film) before landing roles with Buster Keaton in Sherlock Jr. and The Navigator, Ramon Navarro during a dueling scene with swords from the lost film Trifling Women, and Alice Terry and Rudolph Valentino almost kissing in The Four Horsemen of the Apocalypse. Bottom row, left to right, another shot of Rudy, French comedian Max Linder performs his morning calisthenics, and young mother Jane Novak smiles for the camera. Snapshots also portrays a number of stars exiting the Famous Players – Lasky Studio. Here is a full list of star cameos in order of appearance: Agnes Ayers, Jack Holt, Lois Wilson, Anna Q. Nilsson and James Kirkwood, Alta Allen, Mitchell Lewis, June Mathis, Carter De Haven, Owen Moore with director “Vic” Herman, Milton Sills, Walter Heirs, Wesley “Freckles” Barry, Harry Rapf and director Jack Warner, Max Linder, Katherine [sic] McGuire, Viola Dana, Sid Smith and Master Zukor, Jane Novak and daughter Baby Virginia, Jack Kerrigan and his mother, Dorothy Philips, Lloyd Hughes, Rev. Neal Dodd’s “Little Church,” Ramon Navarro in Trifling Women, Lewis Stone, Miss Alice Terry and Rudolph Valentino, “Rudolpho” playing “Armand” to Mme. Nazimova’s “Camille,” Vola Vale with husband Al Russell and son, and “Pal” the canine star. In closing I want to once again thank photo archivists and historians Marc Wanamaker and Bruce Torrence, whose invaluable photographs make this narrative possible. Thanks also to the National Film Preservation Foundation for sharing online so many historic films. 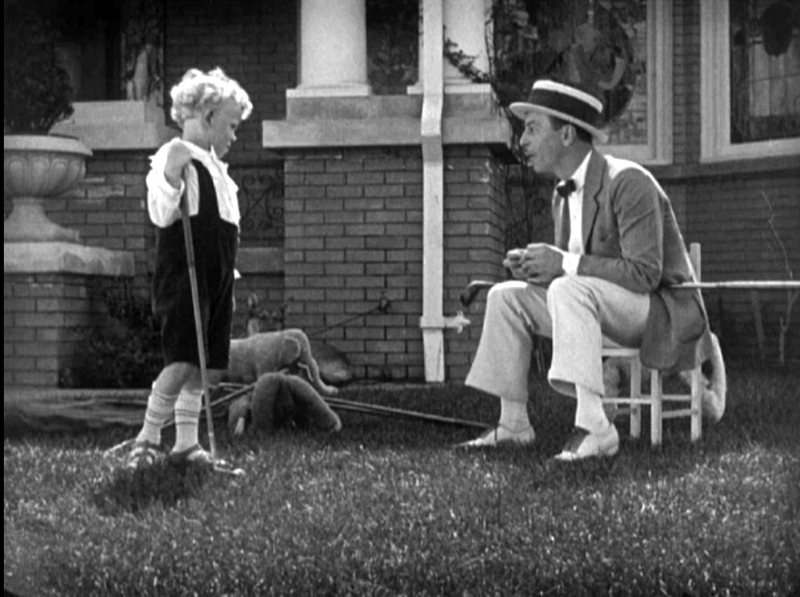 Be certain to check out my post about the many historic connections among Chaplin, Stan Laurel, and Harold Lloyd with Harry Carey’s Soft Shoes (1925), a wonderfully rich film that the NFPF has also posted online for viewing. Be sure to read Paramount archivist Charles Stepczyk’s fascinating research paper about how and why Snapshots was made. Hollywood Snapshots. Copied at 18 frames per second from a 35mm tinted nitrate print preserved by the Academy Film Archive from source material provided by the New Zealand Film Archive. Running Time: 13-1/2 minutes (silent, no music). 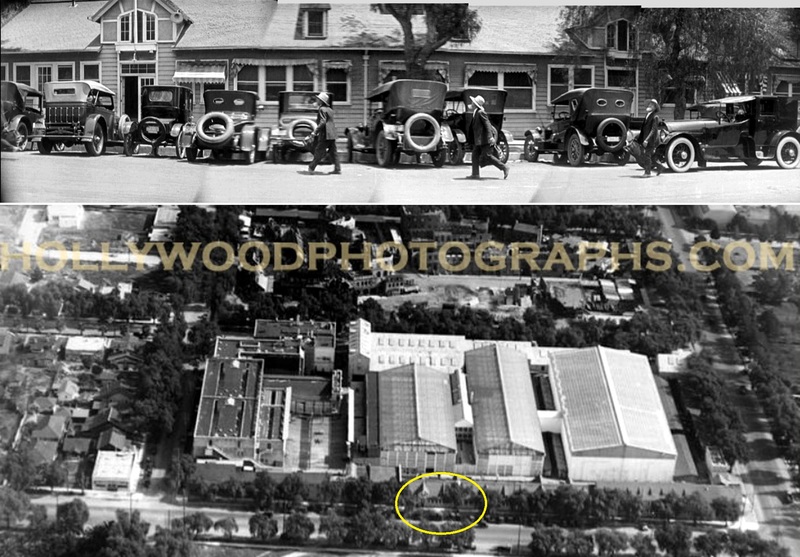 This entry was posted in Hollywood History, Hollywood Tour and tagged Brunton Studio, Famous Players Lasky Studio, Hollywood, Hollywood Boulevard, Hollywood History, Hollywood Hotel, Hollywood Landmarks, Hollywood Studios, Hollywood Tour, NFPF, Pickford - Fairbanks Studio, Silent Movie Locations, then and now. Bookmark the permalink. Thanks for this — another spectacular Time Travel Adventure – Is Hollywood Snapshots on any of the common DVD box sets available? Thanks Bob – not that I know of. It would be great to see this in full Blu-ray detail. I don’t think I’ve ever seen the side of the Lasky Studio before. This was INCREDIBLE to watch. Regarding the houses along Cahuenga Bl. 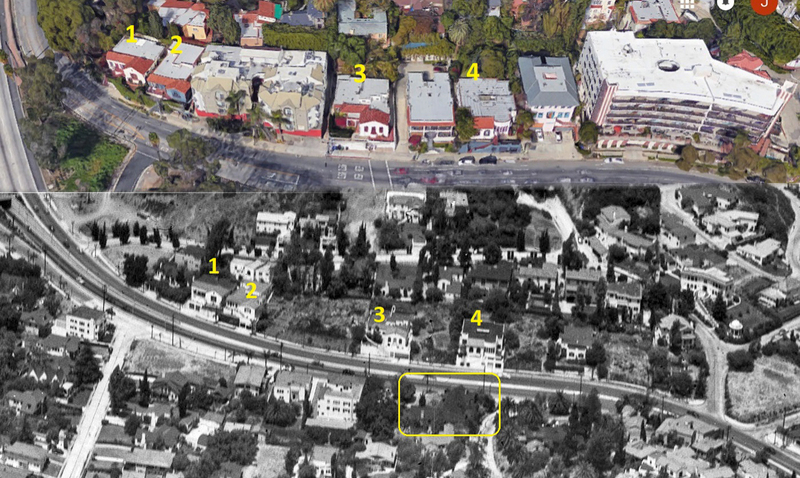 (and its then-and-now aerial photo), I used to go a lot to the house labeled as “#4”; it was rented by a friend of mine for several years. I celebrated Christmas and Thanksgiving there a couple of times also! Your link to the Garden Court Apartment building is a particularly good read. Thanks for another terrific job, John! A treat to read. Thanks for sharing superb information. Your web site is so cool. I am impressed by the details that you have on this blog. It reveals how nicely you perceive this subject. Bookmarked this website page, will come back for extra articles.